My playwright-friend, Albee, emails me that I must see a great play, the Broadway revival of Arthur Miller’s A View from the Bridge starring Liev Schreiber and Scarlett Johansson. Well aware that I don’t have a pot to piss in, he tips me off that first row orchestra rush seats are available at 10 am on the day of the performance for $26.50. This prompts me to consider departing from my usual Saturday ritual of sleeping until noon. I call my equally impoverished sidekick, Milton. If I make the pilgrimage in the frigid cold for a pair of these prize ducats, does he want to see this show? Milton says that he is building shelving to hold his computer since Dell is making a house call to swap out his defective hard drive. Going that extra mile for company is something I can relate to well. I once laid a new carpet in time for a visit from the cable guy. Milton declares that if I am willing to brave the elements for these tickets, he’ll hit the pause button on the shelving to join me for this play. Although during the workweek it is a struggle for me to regain consciousness in the morning, when the alarm rings at daybreak this Saturday, I bolt out of bed with such vigor, my feet seem encased in Acme brand spring shoes. Being on a mission for bargain rate theater tickets is energizing, even though I’m certain that I’ll be the first in line looking like the biggest nerd in New York. I make sure I’m clad entirely in black. 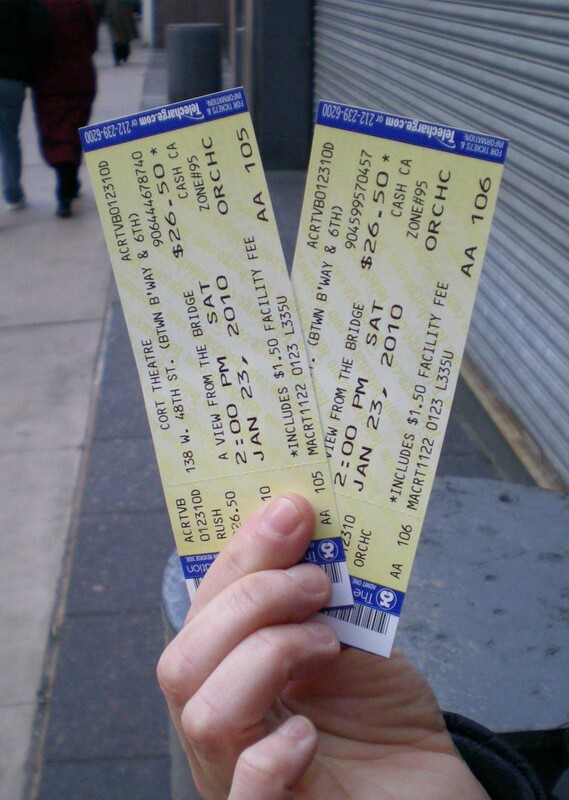 I walk up West 48th Street en route to the Cort Theater at 9 am, confident that I will easily snag a pair of rush seats. Milton and I have good karma. We both donated to Haiti. When I reach the theater I count fourteen people already standing in line. This is worrisome. I know that the first row seats eleven and there are two shows today. I whip out my portable abacus and quickly do the math. If each of the fourteen standing in the cue ahead of me get two rush seats, that’s twenty-eight tickets for twenty-two seats. My confidence wanes significantly. Over the course of the hour, the line triples in size and I know there is no way there will be rush seats for all. Part of me thinks it is best to look at this situation philosophically, “You can’t always get what you want.” The rest of me anticipates getting screwed. I could still be home in bed getting my average looks rest. I am not by nature a violent person, but if there is ever a time when I would like to beat someone maniacally with a rolled up copy of The New Yorker and shout, “Stick a sock in it!” this is the moment. Yet, outwardly, I remain the portrait of patience, even as the two math majors ahead of me reach the window to debate with the weary ticket seller the difference between a $26.50 rush orchestra seat and a $126.50 orchestra seat. Miraculously, a second box office window opens, and it is my turn. Do these fingers look 75-years-old? I return home, call Milton with the good news, and then devour a three-pound buttermilk craisin biscuit washed down with a gallon of tea. The biscuit sits in my gut like an island. I pop a fistful of Rolaids and then head back down to the Cort Theater where I meet Milton. Once inside the theater, sitting in our perfect view front row seats, I feel good and my massive indigestion dissipates. Milton declares, “If we sat any closer, we’d earn Equity cards.” Then, the lights lower. Milton jabs me in the arm in excitement and for the next two hours and fifteen minutes we sit rapt and see one of the most stellar productions on Broadway this season. This entry was posted in Humor and tagged A View from the Bridge, Albee, Broadway, Cort, Liev Schreiber, Milton, rush tickets, Scarlett Johansson. Bookmark the permalink. Great blog and I love the picture on top. I look forward to hearing more about your East Coast adventures. I loved reading your blog, v. entertaining. Hey sounds great but what saloon did you hit afterwards to toast that great production! WOO HOOO. This is frickin’ awesome. Way to go!!! I can’t wait for a new episode, and I love love love the header. I’m signing up. I always knew that you could fly! Bout damn time! I can’t wait for the next one. I love it! great blog! can’t wait to read your next adventure! love the photo at the top too. I saw it too. Miltie is on the money about Miss Johansson!